The ninth annual “Ask a Laureate” event at the University of Toronto was held on Friday May 11, 2018. Students across Ontario participated in the essay contest in which they wrote about various chemistry topics. 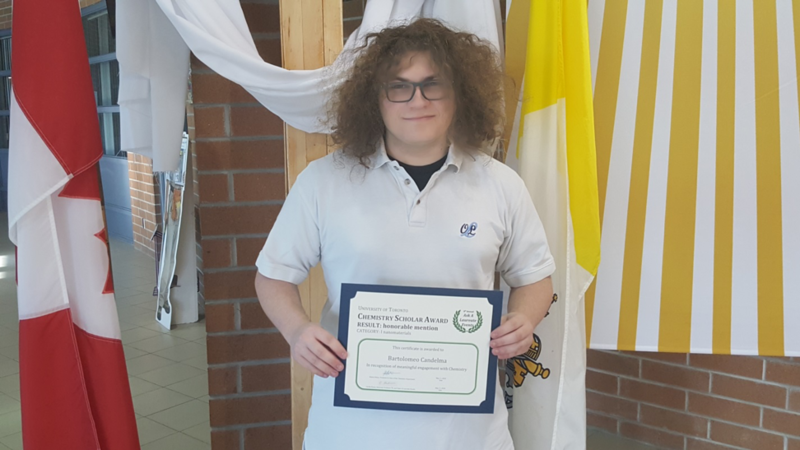 Our Lady of the Lake CCS student Bartolomeo Candelma, with the essay entitled “A Nano Level Invention to a Macro Level Impact”, participated and won a Scholarship Award in recognition of his essay and meaningful research on nanomaterials in the field of Chemistry. Congratulations to Romeo.